A bazillion years ago I was searching for the meaning of life. What that sentence lacks in originality, I make up for with empathy for seekers. Flailing, suffering and confused at the time, now I can’t remember how the book came into my hands. But I do remember this hyper-clearly; I opened the book to the first page and the opening sentence read, “Life is difficult.” The truth is powerful. I devoured The Road Less Traveled, Timeless Edition: A New Psychology of Love, Traditional Values and Spiritual Growth by M. Scott Peck like millions of others and still recommend it as a helpful read. And out of hundreds of pages, it is that sentence, that simple sentence stating the obvious, that stays with me and brings me emotional relief. Because before a truth is obvious there is a lot of suffering due to a lack of clarity. Fast forward several years and I was reading, On Writing Well, 30th Anniversary Edition: The Classic Guide to Writing Nonfiction by William Zinsser with my budding journalist daughter. Zinsser stated that writing is difficult. Likely, anyone reading or writing a blog knows how true that statement is. He went on to explain that this statement isn’t intended to discourage, but rather to encourage writers to work hard at their craft. In other words, if we lie to ourselves and think that writing is easy, or should be easy, then we are likely to quit out of frustration. No one wants to feel a fool unable to do something easy. But let’s take something obviously difficult, like running an Iron Man. Wouldn’t it be foolish to think that one day I could wake up, put on a cute athletic outfit, and complete an Iron Man? Of course it would, although wearing a cute athletic outfit sounds lovely. I know, and our culture knows, that running an Iron Man is crazy hard and takes a ton of training, mental toughness, and a determined focus. I propose that family life is even more difficult than running an Iron Man or writing, with all due respect for the difficulty of both, and that as individuals and as a culture we completely underestimate what it takes to live family life well. While an Iron Man is a grueling 17 hours, family life starts at birth and gruels along until death. While writing is a tedious and creative discipline, family life contains an infinite number of details, variables, and attacks on discipline. There are days when I feel more up to writing a novel on my iPhone while running an Iron Man than I do to meet the demands of my family life. When I’m depleted and exhausted I’m convinced that my state has to do with those people called relatives. Those people who love you and who drive you crazy and who want you to wash their socks. Those people who keep promises, break promises, and are confused when you are crying. Those people who build you up, let you down, and are the inspiration for such cheesy truisms as “Families are like fudge, mostly sweet with a few nuts.” Those people who tolerate me being those people to them. 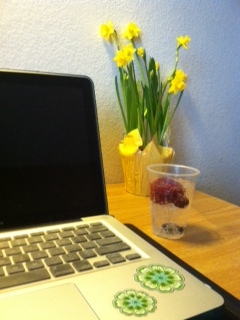 Which gets me to the picture of the pretty yellow daffodils behind the cup of sparkling water with fresh berries. Today was A Terrible, Horrible, No Good, Very Bad Day . Not the kind of day where an emergency happens or tragedy strikes, thank Goodness. But the kind of morning that shatters any pretense that ordinary family life is ever actually easy. , bought myself some sunshiny flowers and berries and chocolate and cheese and artisan bread and I stopped. For a fresh start. And to remember that I don’t read, write, speak and consult about family life because my family life is easy or that I’m oh so perfect at it. My motivation is quite the opposite. I do these things because family life is difficult. And I hope that truth is, and I am, an encouragement to you. Oh, Linda, thank you so much for your encouragement! Sort of explains the White Chocolate Ale, lol. Haha! Yes, it did put a definite light on the subject. Beautiful and touching. You are right, family life may be difficult but the tough moments are worthwhile as the nice moments are better and spread light and happiness all around. Thanks for your comment at Syl´s blog> Hugs to you!!! Beautifully stated Angie. Family life and life in general can be difficult. Sometimes, we have to stop and breathe, then refresh ourselves for a new start. Thanks for sharing, always. And for those who missed my reblog of Sylvester’s blog, check it out here https://familyanswersfast.wordpress.com/2014/02/18/to-see-sunshine-everyday/ Thanks! Thank you Angie. We had a little sunshine here today, so I can send some your way. Ahhh family…… I love this post. You do such good work Angie. Wow! Love the post Angie. I just had one of those weekends where I was down in the dumps and feeling a bit overwhelmed with family/work demands. I let it all take over Sunday and spent my day being grumpy and stressed. I woke up Monday mad at myself for wasting a day of my life being grumpy. We really do have to just step back and breathe! We are so hard on ourselves so often that we miss out on enjoyable moments. I really have to work on this myself! Thank you for sharing. Thank you, Mrs. Pope 🙂 Coming from you, that means so much. Today…is a new…day! That’s the thing, isn’t it? Yes, like is difficult, and it’s all about the “cowboy up” aspect of ourselves that often gets us through it. Sometimes I think that’s one of the tricks to relationships – not to make life easy, (although that can be awesome if possible!) but to help one another cowboy up as best they can. You’re doing great, my friend! Well…..I am late to this party!! I hear ya’…all the way down here in the south!! And you know what I’m going to say, don’t you?? I LOVE THAT YOU WENT AND GOT SOMETHING PRETTY AND YUMMY for the do-over!!! Daffodils are my favorite flower! Been doing some deep breathing down here, too. Lent came early. God’s will be done! Hugs my friend!